Members of the Mongolian contingent at the UN Mission in South Sudan during a medal ceremony in May 2017. In 2006, Mongolia made its first sizeable contribution to UN peacekeeping when it deployed 250 military personnel to the UN Mission in Liberia, a West African country that was recovering from a violent civil war. Six years later, Mongolia undertook it largest deployment to date when it sent a full battalion of 850 troops to the UN Mission in South Sudan, where they continue to play an important role in protecting civilians. Throughout its decade-and-a-half history in UN peacekeeping, Mongolian contributions to UN peacekeeping have been notable for their high standards of training and for the high number of women they deploy. Mongolia has risen to become the 27th largest contributor to UN peacekeeping, with nearly 900 military and police personnel deployed in five operations. But they have not forgotten their first mission--they continue to send a handful of military observers to Western Sahara. A nurse from the Mongolian Hospital Unit in Darfur treats a mother and child (10 December 2012). Peacekeeping is a dangerous business. UN personnel can sustain injuries in the line of duty, the workplace or in vehicular accidents, and harsh conditions and disease can also take its toll. Peacekeeping operations deploy medical contingents contributed by Member States to ensure that UN personnel – troops, police and civilians – receive the best medical care possible. In Kabkabiya in the Darfur region of Sudan, Mongolia has for several years provided a Level Two Hospital to address this need. The unit consists of 68 personnel, 34 men and 34 women, and is responsible for providing UN personnel with health care, emergency resuscitation and stabilization, life and limb-saving surgical interventions, basic dental care and facilitation of casualty evacuation for more severe cases. It also administered vaccinations and other prophylaxis measures. In addition to serving UN staff, the Mongolian hospital unit treated more than 10,000 people from the local communities. Since 2003, more than 14,000 Mongolian peacekeepers have served in UN missions around the world. Today, Mongolia deploys nearly 900 peacekeepers to five UN peacekeeping operations – in South Sudan, Abyei, Darfur, the Democratic Republic of the Congo and Western Sahara. The Mongolian contribution consists of troops, police and unarmed military observers. 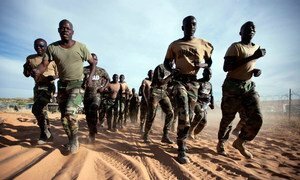 A key task of the UN Mission for the Referendum in Western Sahara (MINURSO) is monitoring the ceasefire observed by the parties since September 1991 – carried out by some 200 military observers. Seen here, a Mongolian military observer serving with MINURSO, together with colleagues from Ghana, France and Bangladesh, check a map while carrying out an observation patrol in the vast area in Smara. A Mongolian peacekeeper provides security as the World Food Programme drops food in Bentiu, South Sudan (21 October 2015). In recent years, the people of South Sudan have simultaneously endured civil war and high levels of food insecurity. Among their tasks, Mongolian peacekeepers provide security as the UN World Food Programme (WFP) drops much-needed food in Bentiu, South Sudan. Their responsibilities also include protecting civilians, securing UN bases, carrying out patrols, escorting convoys, supporting search operations carried out by UN Police, as well as protecting fellow peacekeepers as they carry out road maintenance and demining operations. The head of the UN Mission in South Sudan, David Shearer, awards the UN Medal to Mongolian peacekeepers (8 May 2017). In May 2017, more than 850 Mongolian peacekeepers were awarded the United Nations Medal for their commitment and service to the UN and the people of South Sudan during a ceremony in Bentiu. In awarding the medals, the Head of the UN Mission in South Sudan (UNMISS), David Shearer, praised the Mongolian troops for their “robust, calm and appropriate” approach to peacekeeping. He said the courage and determination they had shown set a high standard for all peacekeeping forces to emulate. “The Mongolian peacekeepers have led the way in terms of robustness which is an approach that we would like to see more of in our peacekeeping efforts in South Sudan,” Mr. Shearer added. Mongolian peacekeepers serving in a guard unit assigned to protect the Special Court for Sierra Leone perform a tactical exercise (26 November 2008). Ensuring justice is a key element of the work of the United Nations, including its peacekeeping operations. The Special Court for Sierra Leone was set up by the Government and the UN to "prosecute persons who bear the greatest responsibility for serious violations of international humanitarian law and Sierra Leonean law" during the country’s civil war (1991-2002). When the UN peacekeeping mission in Sierra Leone closed, the Security Council mandated the UN mission in neighbouring Liberia (UNMIL) to provide security to the detainees and the Court. Mongolia accepted the responsibility and deployed its personnel in early 2006. The well-trained and equipped Mongolian Guard Unit performed to the highest standards and completed its mission years ago.